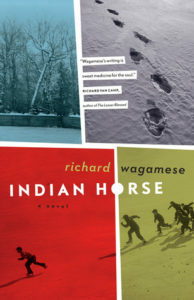 The film adaptation of Richard Wagamese’s Indian Horse was nominated in five categories of the 2018 Leo Awards and won in two categories! It was nominated for best motion picture, best director, best screenwriting, best picture editing, and best musical score. It won best visual effects and best sound. Organised by the Motion Picture Arts & Sciences Foundation of British Columbia, the Leo Awards celebrate and promote the achievements of the British Columbia film and television industry.